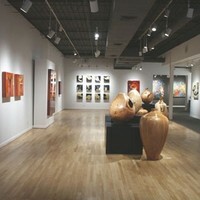 Established in 1981, Alan Avery Art Company is a progressive, trendsetting art gallery of national reputation that constantly pushes the edge in contemporary painting, sculpture and photography. Take MARTA to Lindbergh Center Station. Out of the station walk north on Lindbergh Lane, and turn right on Sidney Marcus Boulevard. Make a left on Piedmont Road, and turn right on Miami Circle to reach the gallery.